The National Oceanic and Atmospheric Administration (NOAA) will purchase data from small commercial satellites to expand its GNSS radio occultation (RO) efforts to better predict weather. In September NOAA, through the government’s Commercial Weather Data Pilot program, awarded contracts to San Francisco, California-based Spire Global ($370,000) and GeoOptics ($695,000), of Pasadena, California, to provide RO data. This data will be used to assess whether commercially provided information can be incorporated into the agency’s weather models. The RO technique has been around for a long time, taking advantage of the effects of electrical energy and moisture in the atmosphere on GNSS signal propagation. The GPS signals bend a bit as they skim through the atmosphere; a deflection that is a function of the density of the atmosphere. The time it takes for the signal to travel the now-longer path around the curve of the planet can be used to calculate atmospheric properties, such as temperature, pressure, humidity and electron density. With its Stratos product, Spire gathers RO data from 10 low Earth orbit (LEO) small, or microsatellites with multiple sensors, tracking GPS signals providing 3.65 atmospheric profiles per year, according to the company. GeoOptics will begin launching its LEO cubesat constellation, CICERO, in early 2017. When RO data is combined with that from polar-orbiting weather satellites, NOAA believes it can make better weather forecasts. 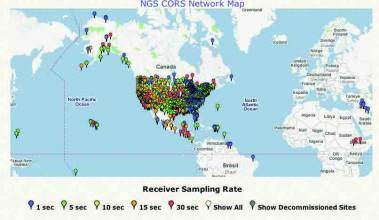 Both Spire and GeoOptics will begin providing GNSS RO data to NOAA by April 30, 2017, the agency said. NOAA’s National Environmental Satellite, Data, and Information Service (NESDIS) will analyze the data and issue a report in early 2018. "[NOAA’s] models take data from a number of sources including radiosondes, land-based stations, and satellites," said Sandy MacDonald, Spire’s director for numerical weather prediction. "GPS RO data delivers a very accurate and detailed sounding of temperature and moisture from the upper atmosphere into the lower atmosphere. About 40 percent of the soundings make it to the lowest layer of the atmosphere, the boundary layer. GPS RO data is exceptionally useful for making bias corrections in the full atmosphere." NOAA already uses GNSS RO data through the six-satellite COSMIC constellation, which is a joint satellite program with Taiwan. The agency has requested more federal funding for COSMIC-2 follow-on satellites. Currently, Spire’s satellites collect RO data in a pre-production capacity, said MacDonald, a 40-year NOAA veteran who leads Spire’s RO efforts in Boulder, Colorado. "Unlike some forms of data, GPS-RO requires processing for it to be useful in forecasting. This September, at the International Radio Occultation Working Group, we revealed the first commercially collected and processed GPS-RO profiles," he said. "The biggest hurdles to getting the data is access to on-time rocket launches. We have the single most aggressive launch schedule in the industry with over 70 satellites manifested over the next year but delays on the launch pad affect how quickly we get access to this data." While Congress approved $3 million for Commercial Weather Data Pilot program, the effort was initiated through the Weather Research and Forecasting Innovation Act. The measure, sponsored by two Oklahoma representatives, Frank Lucas and Jim Bridenstine, both Republicans, calls for commercial data for weather monitoring purposes. U.S. Representative Lamar Smith, R-Texas, who is chairman of the House Committee on Science, Space, and Technology, said it was a good thing that NOAA is acquiring private sector weather data. "In the face of looming data gaps and continual delays with our governmental satellite systems, the private sector can provide data to better predict weather and protect American lives and property," he said. "In the face of real threats, NOAA needs to address its shortfalls and think beyond government weather systems by making further awards under the [Commercial Weather Data Pilot program]. "We see a future with small satellites delivering data of the same quality that required large satellites and much greater cost in the past," MacDonald said. "We’ve already demonstrated that small satellites are most effective when collecting large amounts of data through Spire’s ship tracking product. Similar to ship tracking where frequent updates are important, spatial density is an important factor in the usefulness of GPS RO data. By launching many small satellites, they’re able to capture an exceptional number of occultations in comparison to smaller number of traditional satellites." Small satellites have the attention of the White House Office of Science and Technology Policy (OSTP). A new OSTP initiative, "Harnessing the Small Satellite Revolution," calls for NASA, the Defense Department (DoD), Commerce Department, and other agencies to promote government and private small satellite use. In addition to NOAA’s weather efforts, small satellites will be used for remote sensing, communications, science, and space exploration, the White House said. NASA will fund as much as $30 million in small satellite data purchases, including $25 million for nongovernment spacecraft constellations. NASA also intends to purchase such Earth science observation data as moderate-resolution land imaging and RO data.